Join us at the TypeCon2013 hotel and headquarters! Update! Discounted rooms are no longer available. A limited number of regular rate rooms are available for certain days. Please contact the hotel for details and booking. 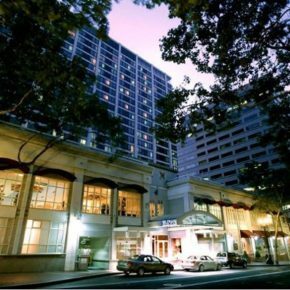 The Hilton Portland & Executive Tower is conveniently located in the heart of downtown Portland and just a block away from the handy MAX Light Rail System — providing easy access to an array of popular attractions and entertainment venues. You’ll be greeted by beautifully appointed guest rooms and enjoy the convenience of not having to travel to and from the conference venue each day. The University Place Hotel is approximately a mile away from the Hilton and offers reasonably priced rooms, free in-room internet, 24-hour fitness facilities, on-site car rentals, and other amenities.